JNN 16 Aug 2014 Yangoon : Rohingya Muslims continue to live under extremely harsh conditions in Myanmar, with tens of thousands now facing severe shortages of food, water and medical care in refugee camps. As part of its long history of discrimination against the community, the central government in Naypyidaw is restricting access to international aid organizations desperate to help Rohingya Muslims. “We are refugees. We lost everything. Why is our government doing this to us? They must really hate us,” an unnamed Rohingya Muslim man at a refugee camp told Press TV. A hospital near the refugee camps for Rohingyas lacks proper medical equipment, and there are no doctors or nurses to offer services to the people in need. “We lost all of our dreams. We lost our homes, our hopes. So now, we are homeless, hopeless. We have no future,” said a young man at a school, which is believed to be the only one servicing over a million Rohingyas. 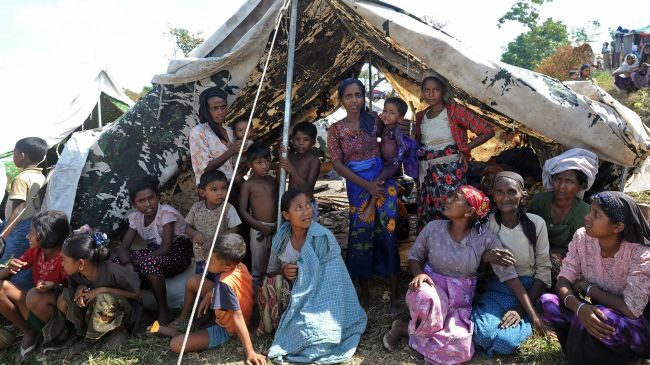 Rohingya Muslims account for about five percent of Myanmar’s population of nearly 60 million. The Myanmar government has been repeatedly criticized by human rights groups for failing to protect the Rohingya Muslims. According to the United Nations, the Rohingyas are one of the world’s most persecuted communities. Hundreds of Rohingya Muslims have been killed and wounded in months of increased sectarian violence in the country. Thousands of others have been forced to flee their homes. This entry was posted in Asia Pacific and tagged Burma, Myanmar, myanmar government, refugee camp, refugee camps, Rohingya Muslims, Sectarianism, yangoon. Bookmark the permalink.